Click on photo to open album for more photos of the event. 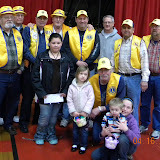 The Tampico Lions Club held their annual Easter Egg Walk in the Tampico Elementary school on Saturday, April 16, 2011. This is a tradition that has gone on for many years. No one seemed to know exactly how many years they have done this, but several of the parents of the children in the walk remembered attending it themselves as a child. Best guestimate was somewhere between 15-20 years. What makes this Egg Walk special and different is that it is not the usual frenzied dash to find eggs, ending with some getting a large portion of the booty and others left without anything. The Tampico Lions Easter Egg Walk is a calm, organized event. Every child goes home with goodies. The children are asked to sign in when they arrive. The names are then put into a box for a drawing at the end of the walk. This year, the Tampico Lions added an extra treat by giving each child their own Easter basket in which to collect the eggs. The Tampico Lions have the children line up single-file at a starting point in the gym. Tables of hundreds of colorful, plastic Easter eggs await them across the room. They are allowed to select one egg each time they walk around the gym. A Tampico Lion counts the remaining eggs before the next walk-around starts, ensuring that each child will be able to select another egg. This year, the 84 kids that attended were able to make 5 rounds. That’s five eggs filled with candy and money – quarters, fifty-cent pieces and/or gold dollars. When there were no longer enough eggs left for each child to make another walk-around, they were asked to be seated in the bleachers. The 18 remaining eggs were divided into two groups: one with six eggs and one with 12 eggs. Cameron Tarbil’s name was drawn for 3rd place, and he received six additional filled eggs. Gracelyn Abell’s name was drawn for 2nd place, and she received the 12 extra filled eggs. Grand Prize was $50 savings bond, donated by People’s National Bank of Kewanee –Tampico Banking Center and was won by Alexis Contreras. The TEA set up tables of decorative Easter Baskets and baked goods, strategically displayed along the walkway to the Egg Walk. Parents were able to buy raffle tickets for a chance to win an Easter Basket or offer a donation for yummy, home-made baked goods. The proceeds are used to help with school projects and supplies throughout the year.